I'm not going to be able to make it, but Urban Blight is playing the Canal Room here in Gotham City on Thursday, May 29th (for the first time since 1998!). Expect a lot of 30 and 40-somethings to be there, reliving the glory daze of the mid-to-late 80s. Seriously, their brand of ska/reggae/R&B/funk drew a huge and well-deserved following in the metro area... If you ever come across their From the Westside to the Eastside EP, pick it up--it's fantastic. 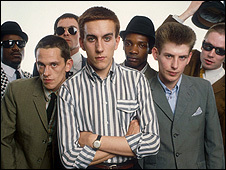 According to The Specials' original rhythm guitarist/vocalist Lynval Golding, all of the original members of The Specials apart from Jerry Dammers are tentatively planning to go on a reunion tour of the UK in October and November (with US gigs a possibility after that). Negotiations are still ongoing with Jerry and they are hopeful that he will be joining them on the keyboard this fall. This and more comes from Bigger Thomas' bass player Marco, who writes an excellent blog that focuses primarily on 80s era ska and reggae bands. Marco and Bigger Thomas played a gig over the holiday weekend with a reunion version of The English Beat (essentially Dave Wakeling) with Lynval filling in on guitar--so this info is solid. Keep your fingers crossed and stay tuned, kids. Editor's note: Shots in the Dark spotlights third-wave ska releases that should have been massive hits on the scene but, due to bad timing, poor luck, or a fickle record-buying public, were lost in the fray. The Band: Toronto-based King Apparatus, Chris Murray's band before he ditched frigid Ontario for the warmth of Southern California, went solo (first as Venice Shoreline Chris, now the Chris Murray Combo), and found (relative) fame amongst US and international ska audiences. The Sound: King Apparatus were one of the few 2 Tone-influenced third-wave acts to almost completely forgo horns and follow The Specials' revved-up guitar/keyboard-focused brand of ska. Interestingly, the Chuck Berry/Roddy Radiation guitar sound that drives Murray's songs often subtly incorporates elements of blues and country music. 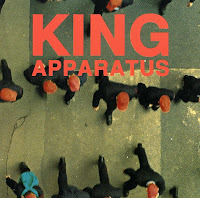 The Release: Despite their obvious musical debt to The Specials, King Apparatus were by no means imitators to the throne--Chris Murray's powerfully original (and often sharply angry) songs coupled with the band's super-charged delivery proved that they were the real thing: a world-class ska band. From the first manic beats of "Non-Stop Drinking" to the defiantly misanthropic "Heartless," King Apparatus grab hold of the listener with their intense, compelling, and incredibly catchy songs and don't let go (after listening to the album for this review, I keep waking up at night hearing "Break Your Heart" running through my head). It's like being buttonholed by Coleridge's haunted Ancient Mariner in a dive bar--Murray is fated to tell you his tales about good and bad relationships ("Wasteland," "Hangin' On"), bogus televangelists ("Live Feed from Heaven"), a false leader urging ignorant kids to launch a racial war ("Tom Metzger's Big Plan"..."an Aryan time bomb/it's gonna get him rich/but it'll get you arrested"), all the characters hanging around waiting to be seen in the ER ("Hospital Waiting Room"), imagining his life as a TV movie ("Made for TV"..."and Nina Hagen/if we can name her price/could play my mother, my sister, my wife") before he can release you into the night, but it's all so good you'll end up buying him a drink because you want to hear more. It's a terrific album that sounds just as good, if not better, in 2008 as it did in 1991. The Sad Circumstances: Originally released on Raw Energy Records in Canada in 1991, King Apparatus' self-titled debut--a big hit for the band north of the border--was picked up for distribution in the US by Moon Records (basically Bucket working out of his basement and me doing promotions part-time, after work out of my kitchen). Unfortunately, at the time, the American ska scene was small, disjointed, and disorganized (the pre-Internet days, baby!) --and this record went largely unnoticed and unsold. Having said that, several college ska DJs did pick up on the release and added it to their playlists and the odd skazine reviewed it, but few ska bands could venture out on the road for a national tour in support of their record (the best way to promote it) without losing their shirts--the ska touring circut just hadn't been firmly established yet. Availability: In print and available from Asian Man Records. It's not everyday that you read about Rastafarianism in the New York Times, but then again, how often is there an exhibition on Rastafari at the Smithsonian National Museum of Natural History in Washington, DC? 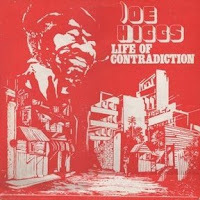 Joe Higgs: "Life of Contradiction"
Originally recorded in 1972 for Island Records, Joe Higgs' Life of Contradiction languished in that label's vaults for three years, while Chris Blackwell tried to figure out how to market Higgs since, at the time, he was considered more of a Jamaican folk singer than a reggae artist (and, no doubt, Blackwell was also busy tending to the ascendant Bob Marley & the Wailers). When the rights reverted back to Higgs, the LP finally saw the light of day in 1975 on the Grounation label, and regardless of the sheer brilliance of the album, Life of Contradiction was very considered to be very much out of step with the reggae of that period--though it immediately strikes the modern listener as the early '70s roots reggae classic that it is. Indeed, several of the tracks had orginally been recorded during the ska era (such as "There's a Reward"); the influence of soul and R&B is powerful on several cuts (particulary on the title track and "Who Brought Down the Curtains"); and some of the arrangements, rhythms, and jazz-inflected performances were definitely atypical of reggae of that period. Of note, Joe Higgs (who was already a hit recording artist with Roy Wilson in the duo Higgs and Wilson) was the vocal coach to The Wailers (Bob Marley, Peter Tosh, and Bunny Livingstone) in 1963 when they were just starting off--and he hooked them up with Coxsone Dodd, who produced their first single, "Simmer Down," which went to the top of the Jamaican charts in 1964 and set them on their long journey to eventual superstardom in the '70s. Like Bob Marley, Higgs has incredible command of his instrument (clearly he knew what he was doing when he taught The Wailers how to harmonize); his singing is wonderfully expressive and nakedly honest. Almost more importantly, he has an extraordinary gift for writing a catchy melody (my son, who tends to dislike reggae in favor of Green Day and the Beatles, was singing along to several of the songs as I played this record--which proves the adage that a good tune is a simply good tune, no matter the genre). All of the tracks on the LP are winners--no chaff here. Before you accuse me of being a shill for Mojo--I swear it's just that they are one of the few major music magazines that covers ska (even if it's in a backwards-looking way)--they are running yet another ska feature (following their great in-depth piece on The Specials last month). Their June 2008 issue contains a five-page story on Prince Buster (the UK cover sports Paul Weller, while US fans will have to settle for Slash...I wonder when the Mojo publishers will figure out that a great deal of their American readers are probably anglophiles/Britpop fans--we can read lots about ex-GNR band members in Rolling Stone and Spin, thank you). I'll let you know if the Prince Buster article is a good read when my local magazine shop gets it in. Costello wanted me out of the band. He'd heard '60s ska and didn't see any room for Chuck Berry or Johhny Thunders. He didn't understand. We weren't trying to revive ska. Terry Hall was hardly Prince Buster. We still had that punk element and the lyrics were from the Pistols/Clash school. I've always hated that "authenticity" argument--ska music was influenced by so many other genres of music (American R&B, early rock'n'roll, mento, etc.) and has organically evolved over the past 50 or so years to incorporate other influences (as it should) that it's insane to think that it's a static art form (or try to "protect" it as such), whether you were in the UK in the late '70s or watching the rise and fall of ska during the '90s in the US. Change happens and change is generally good. Interesting to hear EC's "authenticity" complaint come from someone who is guilty of dabbling in a mind-blowing array of musical genres...(ok, I still love him for My Aim is True, This Year's Model, Armed Forces, Get Happy!, and Trust, with occasional singles here and there).